Give us 27 hours. We’ll give you your best year yet. 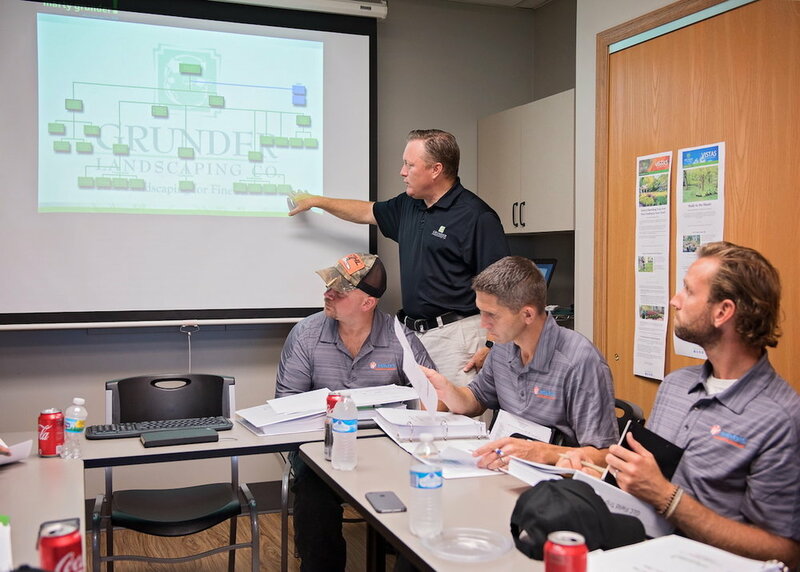 Our Fall Field Trips bring owners and their teams onsite to Grunder Landscaping Co. headquarters in Dayton, Ohio, one of the most successful companies of its kind in the Midwest. You’ll spend a jam-packed day going behind the scenes with Marty, touring the facility and grounds, meeting with the GLC leadership team to see how they operate and optimize each area of the business, and visiting some of the job sites they’re at work on. We purposely limit this event to just 14 attendees so we can guarantee you get the one-on-one attention you need. At day’s end, Marty will welcome you to his family’s home for dinner and a tour of how he’s landscaped their property. We purposely limit these field trips to just 14 attendees to keep the focus on you, your questions, and the challenges you face. You’ll also have the opportunity to expand your professional network with other landscapers from around the country. The hotel restaurant opens for breakfast. Marty picks you up at the hotel and brings you to Grunder Landscaping Co. (GLC) headquarters. Watch the GLC teams roll out. Tour the GLC grounds and facility. Marty presents on GLC’s vision, mission, and core values and how to develop and deepen those at your company. Marty presents on his 11-Step Selling Process. Seth Pflum, GLC’s General Manager, discusses the company’s strategy and tactics for achieving operational efficiency. Lunch and tour GLC job sites. See for yourself how GLC Finance, Administrative and HR, Sales, and Production teams operate. Enjoy free time to focus on your particular interests at GLC. Return to the hotel to freshen up before dinner. Gather for dinner at Marty’s home. ACEs and Field Trip alumni attend at half price; please e-mail lindsey@growgroupinc.com for details. Includes dinner the night before, lunch and dinner the day of, and a business book of our choice. Hotel, travel, and other meals are not included. Please call the office at 1.866.478.6337 and we will try to accommodate you. You will need to provide a credit card number that we can process automatically on agreed-upon dates and the entire balance will need to be paid before the event. There are no refunds for the Fall Field Trips. If you are unable to attend, we will issue you a credit for the entire registration amount, good for 18 months. Alternatively, you may transfer your registration to a substitute participant so long as you do so at least five business days prior to the event. No credits, transfers, or refunds are available on a transferred registration. We work with a local hotel to secure a reduced rate for our guests. After you register for the field trip, we will e-mail you the hotel information. Dayton International Airport (DAY) is the closest to the hotel, around 30 minutes away. Cincinnati/Northern Kentucky International Airport (CVG) is about an hour’s drive to and from the hotel. Port Columbus International Airport (CMH) is about an hour and a half from the hotel. Air fares vary greatly among these airports depending on the carrier. Cabs, Ubers, and shuttle services are available from these airports, but it may be cheaper and simpler to rent a car. If you’d like to share transportation, please provide us with your travel information. If other attendees contact us with similar requests, we will connect you with them to make arrangements. Don’t forget your camera and/or video camera, and a notepad. We’re always happy to answer them. Call us at 1.866.478.6337, or e-mail lindsey@growgroupinc.com.